Matthew Pilkington, who almost certainly knew the artist, perceptively noted how George Barret would work in different styles: ‘He had two decided manners of paintings, both as regard to colour and touch; the first was rather heavy in both, his latter much lighter’. His romantic landscapes of the 1760s are characterised by depth of greens and relatively free brush work, here he responds most closely to the Irish landscape and the aesthetic theories of his friend Edmund Burke. 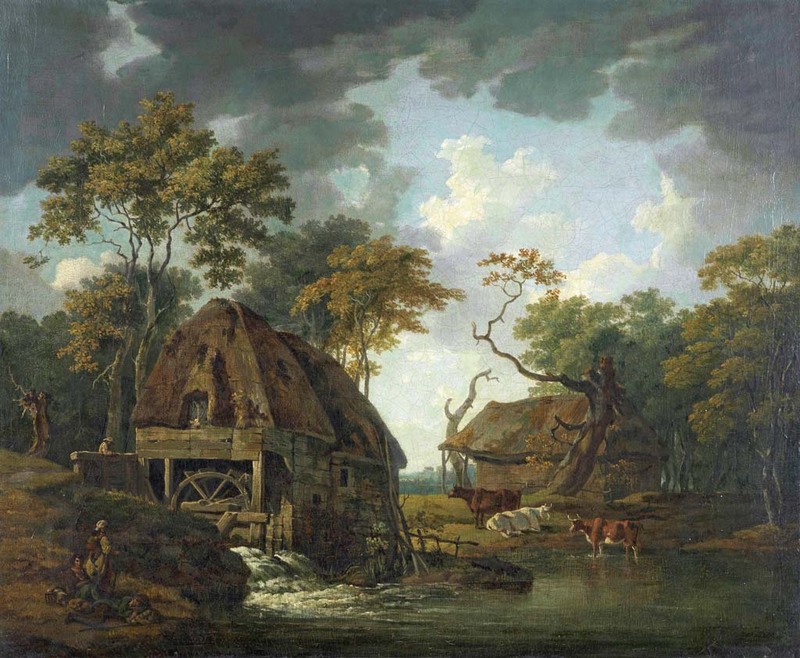 In addition, however, are more precise works such as this landscape with a watermill, where his approach to landscape is rather more domestic in feeling – certainly less monumental – and rather more in keeping with Burke’s definition of the Beautiful as opposed to the Sublime. The present fine work, previously unpublished, partakes of Barret’s two manners. It shows a finely delineated watermill, with figures to one side and cattle to the other outside a barn; overhead the sky is overcast and brooding. Rustic landscapes such as this are less familiar than the verdant works of the 1760s. Among the closest comparisons within Barret’s known oeuvre is a signed Landscape with Cattle, a similar mixture of humble buildings, cattle and figures. Even closer, in both conception and detail, is a drawing by the artist in the Victoria and Albert Museum. In works such as these, Barret’s inspiration is ultimately from the Dutch School. Writing to a young artist, he revealed his eclectic sources of inspiration, recommending the study of Rubens, Claude and Hobbema. 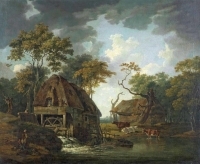 Hobbema, in particular from the 1660s on, made something of a speciality of painting landscapes with watermills – and his work was available for the young Barret to study in the house of his patron Thomas Cobbe. Even closer perhaps is the example of Hobbema’s master Jacob van Ruisdael whose influence on Barret has been specifically noted by Crookshank and Glin. It is tempting to suggest that Barret had seen some of Ruisdael’s Mill landscapes such as those currently in the Boijmans Van Beuningen Museum, Rotterdam, the Getty Museum and an especially similar one now in a private collection which seems to be the inspiration for this particular work. Barret’s interest in artists such as Hobbema and Ruisdael echoes that of Gainsborough and there is also something here of the great English artist’s rustic landscapes. Barret was born in the Liberties in Dublin in either 1728 or 1732. After a spell as an apprentice to a stay-maker, he attended the Dublin Society Schools under Robert West, winning a prize in the 1747 examination. From the same year survives his earliest signed work. By 1755 when he signed and dated his Italianate Landscape (National Gallery of Ireland, on loan to Farmleigh House) he was clearly a highly accomplished and original artist, working in a light rococo style similar to Zuccarelli, who had recently been working in England. About five years later, probably under the influence of Edmund Burke’s thoughts and writings on the picturesque and the sublime, Barret’s style changed, becoming grander and more dramatic. Barret left for London in 1763 bringing with him some of his Wicklow views. On route he passed through the mountains of North Wales sketching the famously picturesque scenery. One of his views of the Welsh mountains was praised in a letter from James Barry to Burke in 1765 and it seems he continued to visit Snowdonia throughout his career. The year after his arrival in London he exhibited a View of Powerscourt Waterfall at the Society of Artists. He was patronised by the Duke of Portland, for whom he painted ten views of Welbeck, Lord Dalkeith and the Duke of Buccleugh. Mathew Pilkington who, as noted above, discerned Barret’s twin manners, gives an acute account of his art. If here Barret’s formal inspiration is ultimately derived from the Dutch School, it is combined with a close study of the verdant Irish countryside, making for a harmonious and elegant composition. A closely related drawing is in the Victoria and Albert Museum.